This Friday April 19, 2013 marks GLSEN’s 18th annual Day of Silence supporting lesbian, gay, bisexual and transgender youth while raising awareness for anti-LGBT bullying and harassment. Hundreds of thousands of students have participated in this student-led event every year. Last year, Amber Hatch, a teenager in Florida, was suspended after wearing a DOS t-shirt and participating in the day’s vow of silence against the dean of student’s warnings that there would be consequences if she followed through with her participation. The student filed a lawsuit against the dean and the school board. However, the school has changed its position and is allowing Amber and other students to particpate in DOS this year. Congratulations, Amber on standing up for your rights and taking a stand for something you believe in. 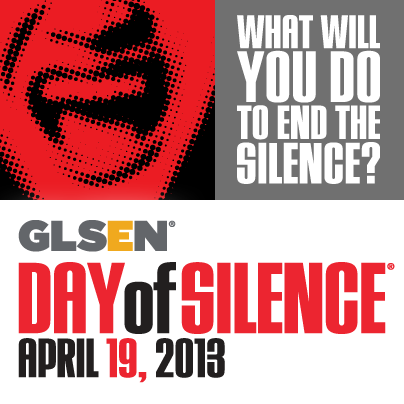 If you are interested in participating this year, check out the official Day of Silence website and you can register your school here.